In a recent 3-part interview with UK Poker News, World Speed Poker Open Champion, Oliver Boyce, discussed his meteoric rise up the poker ladder in 2005. UK Poker News is pleased to say that Oliver has now agreed to write about his ongoing exploits from the poker tables of his native Ireland and beyond, which will include the WSOP from Las Vegas later in the year. Today, Oliver recounts his battle to keep up with the leaders during the early part of the Dublin Cup, a big Irish qualifying event. Firstly I would like to say how delighted I am to be writing for UK Poker News. I hope over the next couple of months that you will read about the major events that I'll be playing; in covering the WSOP in Vegas in July and defending my title in the World Speed Poker Open later in the year in London. I hope this will give encouragement to many new players to the game, as I've achieved this success in just under a year and have earned &euro;100,000 in that time. I admit that it's been a lot of luck to get to this stage, but I now hope to continue on with that success and share it with you. I'll be starting my tournament coverage with the PokerEvents "Dublin Cup", with an estimated prize pool of &euro;80,000. 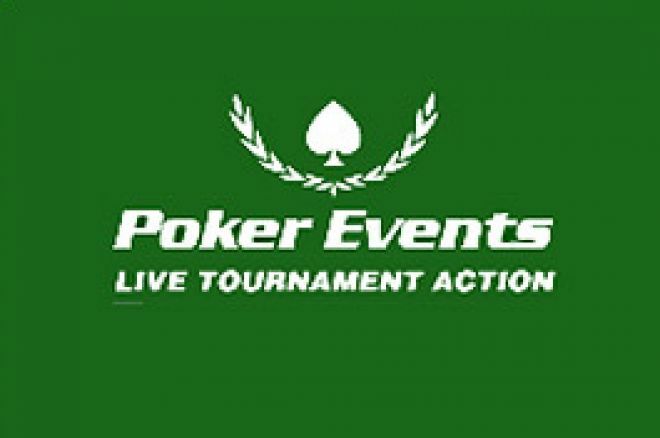 This event is a satellite event for the PokerEvents/Boylesports Irish Open in June which has an entry fee of &euro;3,000; the entry fee for this particular tournament is &euro;500, with a &euro;50 registration fee. PokerEvents run a very professional tournament with the first four levels being 30 minutes and the remaining levels being 40 minutes and a very slow blind structure which will allow for loads of play. It's a 2-day event with an estimated 160 players'; they would be hoping to play down to the final 36 on day 1. Looking at the structure for this event, my initial plan is to play conservative and try to double up on a big hand as early as possible, there's no need to take any risks as the blind levels allow me to play conservative up to level 6 at least, From there on, I'll need to be more aggressive and try to win a pot in each orbit of the table, but I would hope for an above average stack size at this. To win an event like this, you'll need a number of premium hands to hold up and that will be the key to doing well; you'll also need to be involved in a large pot in the middle of the tourney, where you get the chance to double if not triple up. The middle stages of any tourney are the most important, as you don't want to waste chips bluffing, but need to increase your stack to defend your blinds and also protect your position for any dry run of cards you may get. We'll I've arrived at Citywest and all the usual faces are around, Paul Lecky, Anteups Team, Noel Furlong (WSOP Main Event Winner 1999) along with many other top players in Ireland. In the last year I've got to know most of the players in Ireland and I can see that this is going to be a big event with a mix of very good players and a couple of qualifiers. I found my table and I'm in the worst seat possible, Seat 1. I hate to be sitting in seat 1 or 10, as you can't see all the action and players from this position. Anyway, nothing I can do about it. There are 169 players with a prize pool of &euro;84,500, the starting stacks will be 8k. The first 12 players will win tickets to the main event in June which is a &euro;3,000 buy-in. My target is to make the final table and get my ticket for the main event, first prize is &euro;20,000 and a main event ticket. In Level 1, I find AQ, but take the pot down after the flop and later I find A9 in a four way pot and hit two pair on the flop, I'm on the button and its check to me, so I bet out a pot size bet, hoping someone with a hand will think I'm on a steal here, but no luck. At level 3, I find A10 in the big blind and flat call the preflop raise, this player is very aggressive, so I'm hoping for an Ace high flop and take his chips. I get my wish and I check to him, he bets and I flat call making it look like I'm on a flush draw, I check the turn and he bets again with me flat calling. The turn is a blank and I immediately push in all my chips which is about 5k at this stage, he calls and flips over A10 also, a split pot. I ask him did he not worry that I had two pairs or trips and he said no that he had me on a flush draw and that I missed. I was really hoping to push him off his hand at the end, but my original plan seemed to work too well. My biggest hand of the night came at the end of level 4 before the break. I'm in a late position and look down to find QQ, at this stage there's been a lot of premium hands at the table and a few players are short-stacked and willing to take risks to double up. I've about 6k at this stage and I'm also hoping to double up before the break and have been running dry for the last 3 levels. An early position player goes all-in for about 3k and I re-raise all-in, everyone else folds and it comes around to the button, he thinks for a while and than announces all-in. The pot has a total of 14k in it and will nearly treble me up and give me the chance to be above the average stack size. The first player flips over AJ and the button player flips over JJ. So I've only got to avoid 3 Aces and 1 Jack, what more could I've asked for it this situation? I've a bit of history with the button player and he tells me that he could have put me on any pair to make that call, so he thought his JJ was good, the flop has a Queen and the board pairs to give me a house and takes my stack up to 14k. In a few hands later I find JJ in the big blind and I've an early position raiser betting into me, this is the player who I split the A10 pot with earlier, I don't really want to see a flop here and I reckon I'm ahead and will be happy to pick up the 3k in the middle, so I push all-in, he thinks about it for a while and calls, I'm not happy about the call, but he flips over 66 and I'm now motoring with a 20k stack and up with the chip leaders. The break comes and I decide to go and eat and have a walk afterwards. Ed note: Return to UK Poker News to see if Oliver was able to capitalise on his stack-size and secure a Main Event ticket! In the meantime, Download London Poker Club and play an exclusive $3,000 freeroll.